2005 Sea Ray 420 Sundancer This 2005 Sea Ray 420/440 Sundancer is fit with twin 417 Cummins diesels, dual Raymarine C120 monitors, radar, GPS, autopilot, depth, VHF, dual digital air and heat, platinum colored hull, Sea Lift hydraulic platform, JL audio system and low fresh water hours. Vessel is indoor heated in Harrison Township, MI. Please call a few days in advance for an appointment. 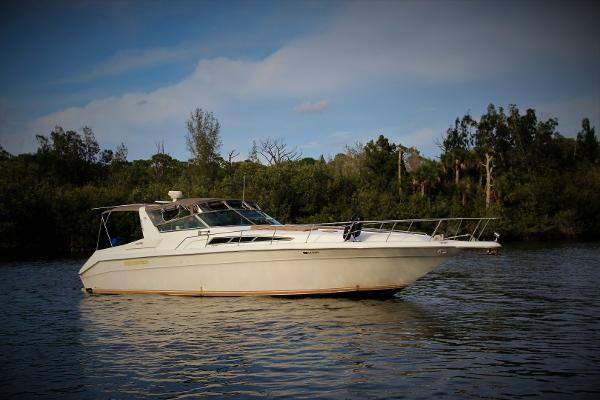 *** 1990 Sea Ray 420 Sundancer *** Seller states that this boat is a 8.5/9 out of 10. Completely redone cockpit area, helm/dash has been updated with the 2013 sea ray styling Cat's have been completely gone through, newer injectors, newer turbos...by certified cat mechanics. No expense spared on this one. ** Updated photos will be added shortly, once boat is commissioned for spring ** Stock #147232 Spacious and accommodating she is not to be outdone for her beautiful & smartly designed interior - MAJOR UPGRADES throughout the boat!!! 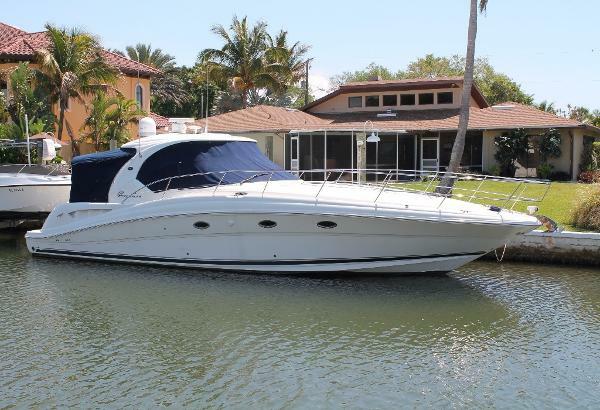 If you are in the market for an express cruiser, look no further than this 1990 Sea Ray 420 Sundancer, just reduced to $68,000 (offers encouraged). 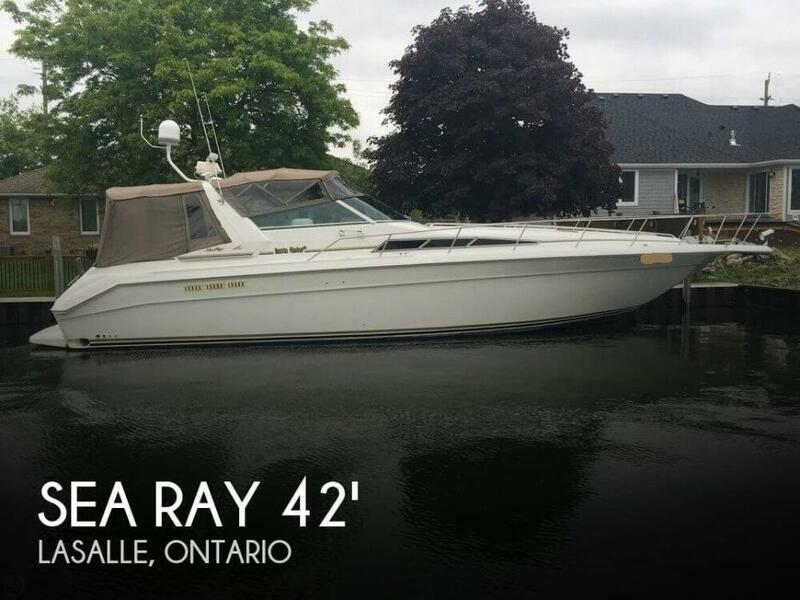 This vessel is located in Lasalle, Ontario and is in great condition. She is also equipped with twin Caterpillar engines that have 2,400 hours. I have not been able to visit the vessel yet because the vessel is wrapped and on the hard. Per the seller: Approxmently 1300 hours Shes in beautiful condition. Well Maintained, With records In Excellent working order. Stock #140727 420 Dancer w/Twin Diesels! Beautiful Condition, Well Maintained, FULL ENCLOSURE! 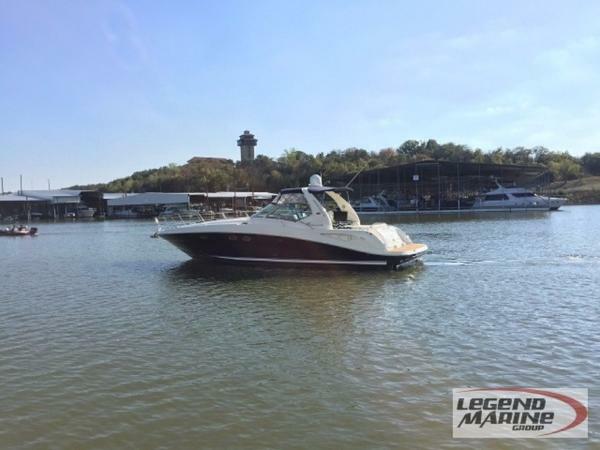 If you are in the market for an express cruiser, look no further than this 1990 Sea Ray 420 Sundancer, priced right at $79,000 (offers encouraged). 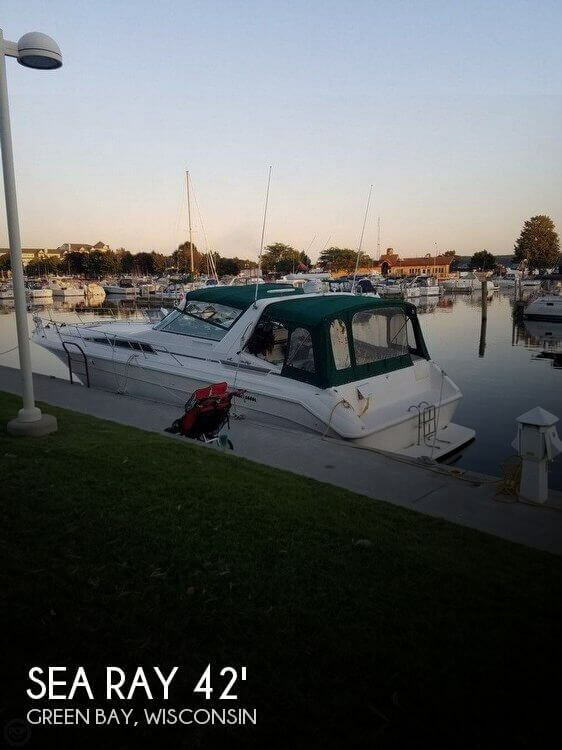 This vessel is located in Green Bay, Wisconsin and is in great condition. She is also equipped with twin Caterpillar engines that have 1,300 hours. Reason for selling is buying larger boat. 2005 Sea Ray 420 Sundancer (CURRENT OWNER OF 4-YEARS) PRIDE OF OWNERSHIP SHOWS THROUGHOUT THIS LIGHTLY USED 2005 SEA RAY 420 SUNDANCER -- PLEASE SEE FULL SPECS FOR COMPLETE LISTING DETAILS. LOW INTEREST EXTENDED TERM FINANCING AVAILABLE -- CALL OR EMAIL OUR SALES OFFICE FOR DETAILS. Freshwater / Great Lakes boat since new this vessel features Twin Cummins 6CTA 417-hp Diesel Engine's with 586 original hours. Notable features include but are not limited to the following: Air-Conditioning & Heat (2-Units), (2) Head's (Vacuflush) w/Vanity/Sink/Shower (Note Stall-Shower Forward), Central Vacuum System, Windlass Anchor (w/Freshwater Washdown), Onan 9MDKAV Generator (800-Hours), Complete Electronics Package (Raymarine VHF Marine Radio, (2) Raymarine E-120 Display's w/HD-Radar, Raymarine Autopilot, WiFi Booster), Cockpit Wet Bar w/Sink/Refrigerator, Premium Sony Sound System (Note Upgraded JL-Audio Speaker's & Sub-woofer), Removable Cockpit Carpeting, and MUCH more! Broker Notes: 600-hour engine service 2016, newer batteries, annual lube/filter service, professionally serviced. Newer Ramarine Electronics. Newer LCD-Television (salon.) LED cockpit lighting. New cockpit carpeting 2017, new cabin canvas carpet runners 2017. Highly recommended by listing agent! 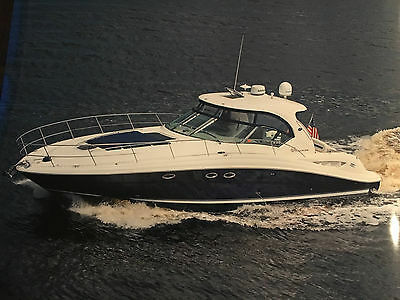 The PowerBoat Guide had this to say: Yet another Sea Ray sales success story, the 420 Sundancer (called the 44 Sundancer in 200608) set the gold standard for express yacht styling and luxury during her production years. Indeed, her muscular lines compared well with the best Mediterranean sportcruisers of her era, and a large cockpit and spacious interior made many of her European counterparts seem small in comparison. Built on a deep-V hull with prop pockets and a relatively wide 14-foot beam, the luxurious two-stateroom, two-head floor-plan of the 420 Sundancer is an impressive blend of high-gloss cherry joinery, Ultra-leather seating, and designer fabrics. Privacy doors (not curtains) separate both staterooms from the salon, and the Sundancers full-service galley includes an under-counter refrigerator/freezer in addition to Corian counters and hardwood flooring. Topside, a flip-up bolster seat is standard at the helm, and the entire cockpit sole can be raised at the push of a button for engine access. Note the extended swim platform, split forward head, and underwater exhaust system. 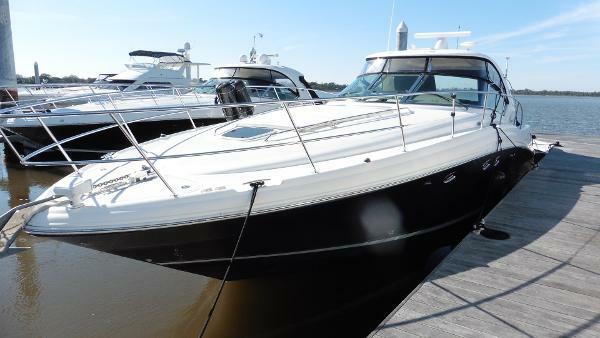 2003 Sea Ray 420 Sundancer State-of-the-art sport yacht is an impressive blend of European styling, posh accommodations. Wide 14' beam allows huge interior with two private staterooms with privacy doors (not curtains). Lacquered cherry woodwork, leather sofas. Massive cockpit features U-shaped lounge seating aft, perfect helm layout. Aft section of cockpit lifts electrically for engine access. Full cockpit bimini top with clear enclosure w/aft back drop canvas. Huge swim platform with trunk storage hatch. A good turn of speed is achieved with a pair of Cummins Diamond Series 450HP diesels cruising in the mid 20's & about 30 knots top. 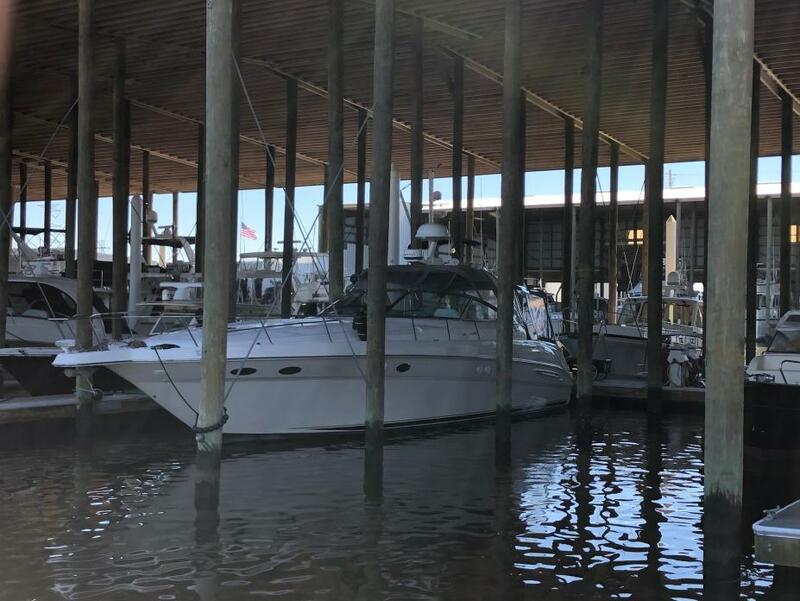 2004 Sea Ray 420 Sundancer 2004 SEA RAY 420 Dancer Fresh Water 420 DA 2004 Sea Ray 420 Sundancer Twin Mercury 496's 375HP Each 420ECM Hours, All Fresh Water, Bow Thruster, New Sea Deck Cockpit & Platform Flooring, Cockpit Cover, Full Enclosure, Sat TV, Cockpit TV, Upgraded Stereo, New Bottom Paint and Detail 11/16 and much more call today for all the details. Located on Lake Texoma Showings by appointment. All Trades Accepted, Financing & World Wide delivery available. Legend Marine Group STOCKS a Broad selection of Boats from Fountain, Donzi, Formula, Baja, Daves Custom Boats, Eliminator, MTI, Skater, Outerlimits, Cigarette Racing and MORE. 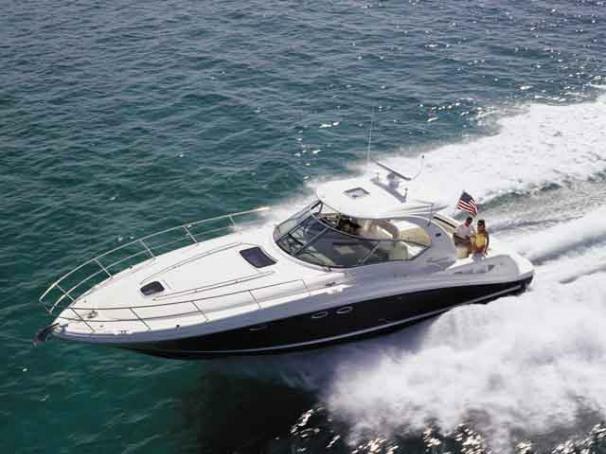 Our inventory also includes over 50 used and brokerage hi-performance boats from all manufacturers. Our 30,000 sq foot sales, parts and service facility is located in Carrollton, TX 2 miles North of Dallas, TX & only 10 min from (DFW), (DAL) Air Port or Addison Air Field (ADS) for Private Air Transportation. We are a full line Mercury hi-performance dealer and offer an extensive parts inventory as well as complete service on motors ranging from 185hp to over 1400hp. Our Professional & Experienced sales and service staff will fulfill all your boating needs today!! 2005 Sea Ray 420 Sundancer The Sea Ray 420 Sundancer is a stylish express cruiser with a large cockpit and spacious interior. She has two staterooms and two heads inside, and enough seating outside for a family and friends to enjoy. Powered by twin Cummins 450 HP diesel engines with very low hours, she will cruise in the mid 20s and top out around 30 knots. This boat is in Bristol condition both cosmetically and mechanically and comes with the following features: Generator Air conditioning & heat (including the cockpit) Bow thruster Full electronics with two Raymarine C120 displays Satellite TV Fresh bottom paint Full mechanical service (including injectors, valves & cooling system) Call now before she goes! 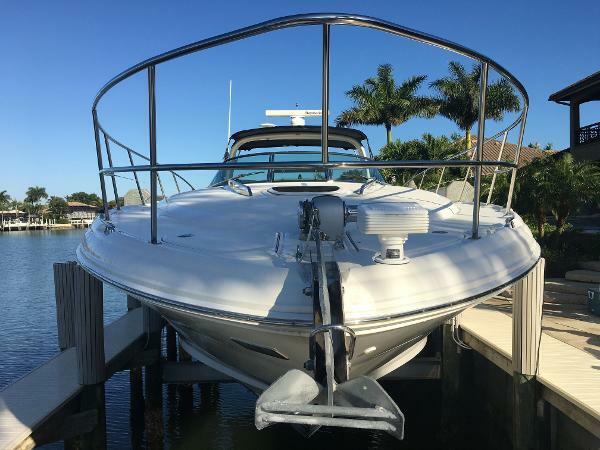 2005 Sea Ray 420 Sundancer SUPER CLEAN! ONLY 2 OWNERS SINCE NEW! LOADED WITH OPTIONS LIKE BOW THRUSTER AND UPGRADED BEAUTIFUL PEWTER HULL! POWERED BY TWIN FRESH WATER COOLED MERCRUISER 8.1L S HORIZON INBOARDS, ONLY 375 HRS, V-DRIVES OTHER OPTIONS INSTALLED INCLUDING: HARD TOP, , KOHLER 7.3E GENERATOR, BOW THRUSTER, 6 BATTERIES, COCKPIT AIR CONDITIONING / HEATING, UPGRADED CD/STEREO AND SPEAKERS, CD CHANGER, SATELLITE KVH TRACKVISION, WINDLASS WITH ANCHOR, TRANSOM SHOWER, MICRO, DUAL BURNER STOVE, SNAP-IN COCKPIT CARPET, CARPET RUNNERS (CABIN), BLACK CUSTOM CANVAS PACKAGE WITH CLEAR GLASS IN REAR (2016), COCKPIT COVER, SUNPAD (BOW), SMARTCRAFT VESSEL VIEW, DUAL RAYMARINE E120 GPS CHARTPLOTTERS, 2 VACCU FLUSH HEADS, STAND UP SHOWER, TRANSOM SHOWER, COCKPIT REFRIGERATOR, FREEZER AND REFRIGERATOR (CABIN), FIRE EXTINGUISHING SYSTEM, BILGE HEATER, COCKPIT TABLE, REMOTE CONTROLLED SPOTLIGHT, COCKPIT WET BAR, DIGITAL DEPTHFINDER, 4 TV'S/DVD PLAYERS INCLUDING REMOVABLE COCKPIT LCD TV, CENTRAL VACCUM SYSTEM, 4 LUMITECH SEA BLAZE 3 (BLUE/WHITE) UNDERWATER LED LIGHTS BOAT RUNS AND LOOKS LIKE NEW! 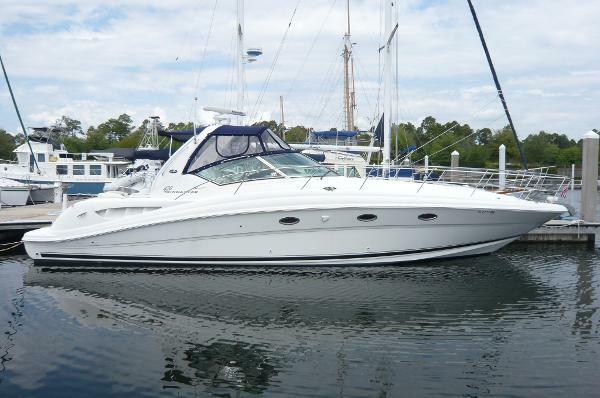 FULLY SERVICED AND FULLY DETAILED, ONE OF THE CLEANEST SEA RAY 420 SUNDANCERS ON THE MARKET! BOAT IS TURN KEY! BOAT LOCATED AT EAGLE MOUNTAIN LAKE, FORT WORTH, TEXAS "WE FINANCE", "WE SHIP" CALL FOR MORE INFORMATION. 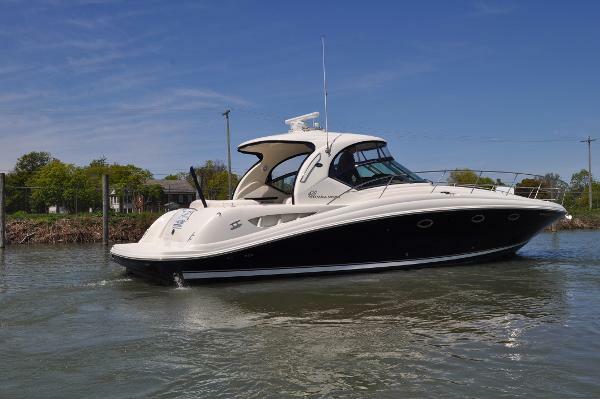 2004 Sea Ray 420 Sundancer TRADES CONSIDERED! BOW THRUESTER, HARDTOP, BLUE HULL! Twin Cummins 450HP inboard diesel power with 1596 original hours of use, all maintenance is up to date, Onan generator, AC/Heat (2 Zone), bow sun pads, cockpit table, Raymarine RL80CRC GPS/Chartplotter with 4KW open array radar, Raymarine Autopilot, Sea Ray Navigator GPS, Raymarine 215 VHF radio, full canvas enclosure, cherry wood interior, central vacuum system, stainless steel windshield, anchor windlass. 2005 Sea Ray 420 Sundancer This Sundancer is clean and well maintained. She has all of the amenities of a much bigger sport yacht. A large cockpit for entertaining with Cockpit A/C and wet bar with ice maker. The salon has a high/low table the converts into another bed for guest. The galley has all of the comforts of home, cook top, refrigerator/freezer, microwave, and plenty of storage. Master stateroom with separate head and shower. Guest stateroom has hardwood doors for privacy.Cockpit A/CCockpit TVCentral Vacuum SystemUpdated ElectronicsCamper Canvas Please call for details. 1990 Sea Ray 420 Sundancer This custom 420 Sundancer with CAT 3208TA diesels, is a great example of Sea Ray's ability to maximum space on the water with style. It boasts a plush cockpit that seats 12 , a 10 speaker multi zone sound system, and a cockpit wet bar making it a perfect yacht for entertaining. Below deck there is plenty of room for those long weekend trips. The layout includes 2 double births, a full galley , a spacious salon and a generous 14 foot beam that has the feel of a 50' yacht. She is a must see for the boater looking for something one of a kind. 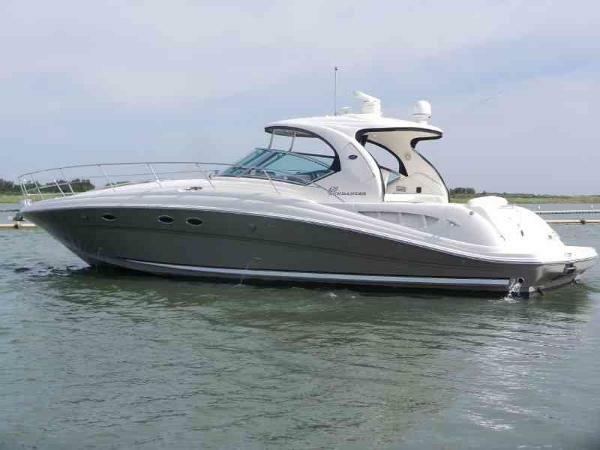 2004 Sea Ray 420 Sundancer Don't miss this 420 Sundancer with updated Garmin Electronics Package. Recently serviced Cummins Diesel Power and fresh buff and wax March 2017. Vessel has been updated with dual Garmin Chart Plotters & Radar and VHF Radio. The 42 Sundancer offers two private staterooms with two separate heads. Easy to see in downtown Charleston, South Carolina - 20 minutes from airport. 2003 Sea Ray 420 Sundancer 2003 Sea Ray 420 Sundancer with twin Cummins 8.3 420HP. The best combo made! This vessel lived it's first 7 years in WI fresh water lakes and heated storage in the winter, then cruised down river to a spoiled spot in FL and Lift kept. The engines have been very well maintained with 736 Hours. 24-25mph at 2100rpm with .8 mpg for a cruise and 32mph at Top Speed. New windless in 2016, stainless dinghy mount, RO water system at sink, Raymarine ST7001+ Auto Pilot, Standard Horizon RAM 3 VHF (2017), Raymarine RL80C, Raymarine RN300 GPS, Raymarine ST60, Sea Fire System, ACR remote pad, Clarion System and a new Garmin ECHOmap 70DV (2015), 2 New engine lift cylinders 2016, Full Cockpit Cover and Full Camper aft top with screens/glass, cockpit carpet. Canvas in great condition. 2 Staterooms and 2 heads. This vessel has the largest separate master shower in its class.